October 4, 2016 – Seeing deep into space requires large telescopes. The larger the telescope, the more light it collects, and the sharper the image it provides. For example, NASA’s Kepler space observatory, with a mirror diameter of under one meter, is searching for exoplanets orbiting stars up to 3,000 light-years away. By contrast, the Hubble Space Telescope, with a 2.4-meter mirror, has studied stars more than 10 billion light-years away. Now the California Institute of Technology’s Sergio Pellegrino and colleagues are proposing a space observatory that would have a primary mirror with a diameter of 100 meters—40 times larger than Hubble’s. Space telescopes, which provide some of the clearest images of the universe, are typically limited in size due to the difficulty and expense of sending large items into space. Pellegrino’s team would circumvent that issue by shipping the mirror up as separate components that would be assembled, in space, by robots. Their design calls for the use of more than 300 deployable truss modules that could be unfolded to form a scaffolding upon which a commensurate number of small mirror plates could be placed to create a large segmented mirror. The assembly of the scaffolding and the attachment of the many mirrors is a task well-suited to robots, Pellegrino and his colleagues say. 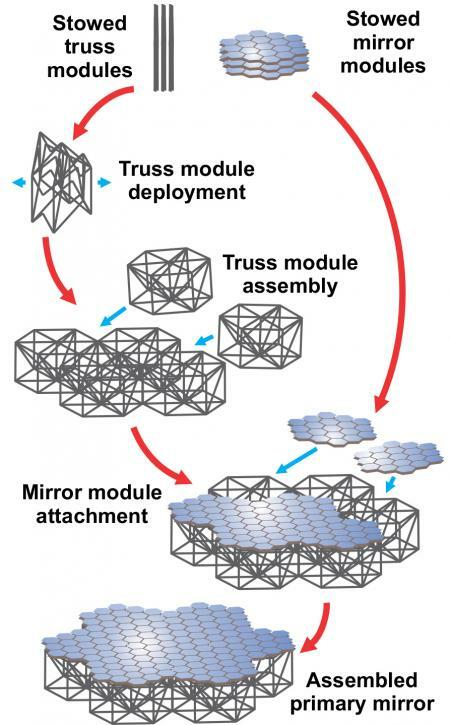 In their concept, a spider-like, six-armed “hexbot” would assemble the trusswork and then crawl across the structure to build the mirror atop it. It was modeled on the JPL RoboSimian system, which in 2015 completed the DARPA Robotics Challenge, a federal competition aimed at spurring the development of robots that could perform complicated tasks that would be dangerous for humans. The hexbot would run on electrical power from the telescope’s solar grid. It would use four of its arms to walk—with one leg moving at any given time, while the three others remain securely attached to the structure. The two remaining arms would be free to assemble the trusses and mirrors. The realization of such an assembly is still decades away. However, Pellegrino and his colleagues are already working on the various technologies that will be needed to make it possible. The entire space observatory would be composed of the fully assembled mirror-and-truss structure and three other parts, flying in formation. An optics and instrumentation unit would be located about 400 meters from the mirror; a control unit, stationed about 400 meters beyond that, would align the system and keep it working properly; and a thin shade, roughly 20 meters in diameter, would shield the mirror from the sun to keep its temperature stable and consistent across its diameter. The four-part assembly would be stationed at one of the sun–earth Lagrange points—locations between the sun and the earth where the pull of gravity from two bodies locks a satellite into orbit with them, allowing it to maintain a stable position. There, the space observatory could peer deep into space without drifting out of place. Pellegrino collaborated with Joel Burdick, Nicolas Lee, and Kristina Hogstrom of Caltech, as well as Paul Backes, Christine Fuller, Brett Kennedy, Junggon Kim, Rudranarayan Mukherjee, Carl Seubert, and Yen-Hung Wu of JPL. 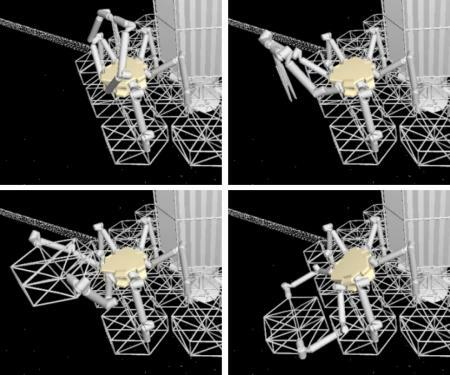 A paper about the work, titled “Architecture for in-space robotic assembly of a modular space telescope,” was published by the Journal of Astronomical Telescopes, Instruments, and Systems. This research was supported by NASA and the W. M. Keck Institute for Space Studies.